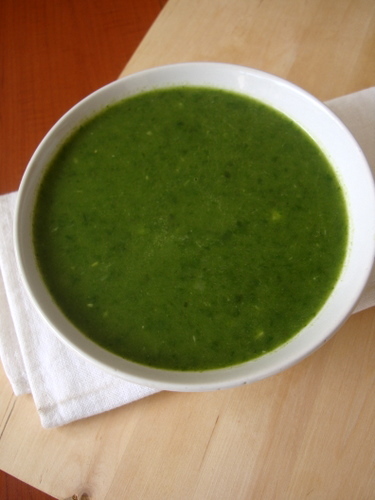 Despite the humble ingredients, this spinach soup is simple yet extremely flavorful. And you can bring it to the table in less than 30 minutes. Do check out another version of spinach soup I blogged earlier on. 1 Heat butter in a pan, add cloves, cinnamon, bay leaf and curry leaves. Saute for few secs. Add the onions, chopped garlic and ginger and saute for 4 mts. Add the spinach leaves along with a green chili and saute for another 2 mts. 2 Add 4 cups of water. Let it cook till the leaves turn tender, approx 5-6 mts. Do not over cook. 3 When cool, strain. Discard the cloves, bay leaf and cinnamon stick. Puree the spinach-onion mixture. 4 Add the the left over strained stock to the pureed spinach and let it simmer on medium heat. Add salt and black pepper powder and mix. Simmer for about 8 mts. Add the rice flour mixture and go on stirring till the soup thickens slightly. Add malai or fresh cream and mix. Turn off heat. 5 Serve hot along with a few croutons. Looks really healthy and warming. Just right for the monsoons. Lovely color.. warm and comforting soup..
Hi Sailugaru,iam a gr8 fan of your recipes,recently i have seen many of your recipe pictures on ndtv recipes but under other name.I just wanted to get you informed. Looks so yumm….I recently made palak puris with the puree and the similar ingredients which I learnt from my co-sis(Hyd). My kids simply love it!! healthy n yummy soup. lovely colour.i will try. I tried this last night…..turned out very nice. Skipped the curry leaves and bay leaf though as I didn’t have them. Was also a bit skeptical about curry leaves, but will try with them again.. Of all the recipes I found online, this was the only one which seemed practical and felt yummy. We prepared this palak soup today and it turned out sooooo delicious. It is totally healthy one & has got yummy taste in it. I have never had such a tasty soup in my life,lovely recipe. We totally enjoyed it to the core and feel like making it often . Thanks for sharing such a healthy and wonderful recipe. this soup says to top w/ malai. What is that, when I look it up its either a kind of soup or a kind of desert. Malai is top of milk. You can use fresh cream.